Why did Team Russia disappoint…again? 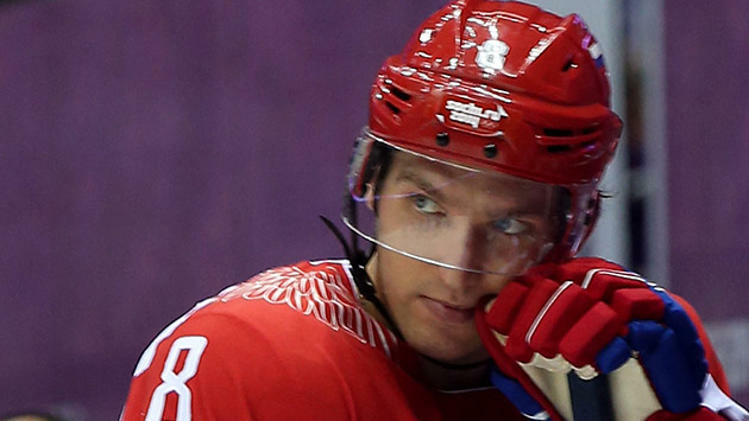 Entering the men’s hockey tournament in Sochi, the Russians were favored to win gold, or at least any medal. Now, with Wednesday’s 3-1 loss to Finland, the host nation will not be on the podium during the ceremony following the tournament’s conclusion on Sunday. Despite being a world-renown hockey powerhouse, developing superstars such as Alexander Ovechkin, Ilya Kovalchuk, and Pavel Datsyuk, they have only medaled twice (neither of which gold) in the Olympics since the NHL was allowed in, in 1998, and haven’t medaled since 2002 at Salt Lake City. Despite this, they are favored to win something, be it gold or any medal, every Olympic games. So how do they keep letting their proud motherland down? There are a couple of explanations I will offer you: lack of chemistry, and a back end that just doesn’t shape up like other powerhouses. Team chemistry is pretty difficult to create and maintain during the Olympic games. Players are separated from their teammates, with whom they’ve been playing for the entire season, if not longer, and joined with members of other teams, and in some cases, different leagues. Teams have maybe a couple of days to acquaint themselves before playing games. Team Russia may have had trouble here, as they had just 14 NHL players on their roster, along with 11 KHL players, compared to 25 NHLers for the USA and Canada, 24 for Sweden, and so on. The Russians had to adjust to new players they may or may not have seen before, with a half/half roster. It’s quite difficult creating good chemistry with players you just met a couple of days ago. Alternatively, it may just be their back end. We know that they have offensive super-players like Ovechkin and Kovalchuk and Datsyuk, but their blue line crew isn’t quite up to world-class level. I will list them from most impactful in the NHL to least: Andrei Markov, Slava Voynov, Fedor Tyutin, Nikita Nikitin, Alexei Emelin, and Anton Belov (with Yevgeny Medvedev and Ilya Nikulin from the KHL). Once you pass Voynov on that list, it might take a true hockey fan, or just a local fan of their respective team, to know really who these players are. Markov’s been around the block, and Voynov was on a recent Cup winner. But there is a reason these guys aren’t so well known: they aren’t nearly as good as their mix-and-match front end. Combine a blue line you can’t completely trust, with boom-or-bust goalies Sergei Bobrovsky and Semyon Varlamov, it can lead to some holes in the back that even a dynamic (no KHL-team-related-pun intended) offense can’t make up. I could be completely wrong on both ends here. I was just offering some ideas. They played tough teams that were just better than them, or had too much pressure on them to win as the host nation, much like Canada in 2010, or the USA in 1960 and 1980. But this has been a recurring theme for the Russians in the Olympics. They haven’t lived up to expectation in quite some time. Maybe it’s time they take a step back and reorganize their group for the 2018 games in Pyeongchang, although it’s quite a ways away. They might have to if Vladimir Putin has his way, after this year’s showing. Team Latvia may have lost, but they are still winners in my books. Should Rajon Rondo Have Been Traded?